The original Descanso library building as it currently looks. How the library building looked in its original setting, where it stayed from 1961 to 1990. On April 24, 1914, fifteen members of the Descanso community and the Descanso Improvement Club petitioned the San Diego County Board of Supervisors for a branch of the County Library at Descanso. Following approval by the Supervisors, the Descanso Branch Library was housed in the Oak Grove Store with Mrs. Inez Gorton as its first Librarian. 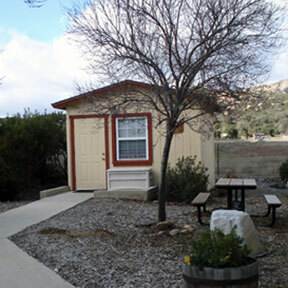 A new library, built in 1997 with funds raised by the Descanso Community and the Friends of the Descanso Library (“the Friends”) opened its doors near the Descanso School with the “Little Library” moved to the same site, and later the Friends and the community raised funds to construct the community and teen rooms of the Library. Descanso is proud of and committed to its Library. The Library serves as the hub of the community. a site of social interaction, learning by students and adults, a resource for civic, economic and health information and a source of entertainment for all citizens. The citizens of Descanso celebrate its 100th anniversary. The Little Library That Could....Did! Descanso is a small community, nestled in the foothills forty miles east of San Diego and surrounded by state park and national forest lands. There is little commerce or industry to help support civic needs. In 1984, a small group of citizens met to form the Friends of the Descanso Library. Today, we list 76 families. As we talked enthusiastically about programs and projects, it soon became apparent that we really couldn't do much to expand library services in Descanso without a larger facility to work from. The 12-foot by 16-foot building serving this tiny community of 3000 had no room for study or browsing or even a restroom. The steep climb from the road made use by seniors and the handicapped difficult. We decided to launch what became a twelve-year effort to secure a new library. We acquired tax-exempt status, scouted for potential sites, explored building programs. Our first major fund-raising project resulted in two original histories of the Descanso area. We researched the archives and the literature, interviewed old-timers, and eventually produced two publications. The sale of these volumes has been a slow but steady source of income for our projects. You can purchase these books at the Descanso branch library. We continued to hold book sales, raffles, and yard sales; we sold notepaper and tote bags with our historical themes; we sponsored old-time western movie showings in a local landmark barn. We sought grants from foundations and gifts from local citizens. The children of the Descanso Elementary School, in two separate drives, raised nearly $2000 to help furnish the library. All told, we acquired $62,473 in foundation grants and major donations to augment our fund-raising effords. A supportive community twice named the Friends of the Descanso Library as its "Citizens of the Year." After many successes and disappointments, our efforts were rewarded. In August of 1990, the Mountain Empire Unified School District Board, recognizing the advantage of having the library's resources readily available to its students, granted a cost-free lease for a site on school property. In April, 1995, through the efforts of the San Diego County Library staff, we received a grant of $74,500 from the California Library Services and Construction Act Fund. This grant matched the $74,500 contributed by the community to make our library possible. Additional State and County funding helped pay for the total cost of the project: $211,591.00. The combined efforts of the Friends of the Descanso Library, the community, the San Diego County Library staff and officials, and State resources had enabled us to build an attractive, well-equipped library, ten times larger than its predecessor. 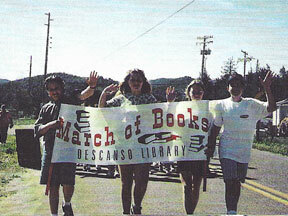 On April 18, 1997, the Descanso Elementary students descended en masse to the old library. There, they each collected a bag of books and, accompanied by the strains of "The Library Song," marched the half-mile or so to deliver the books to the new library. By May 23, Friends and staffers had completed the move. At a memorable outdoor ceremony, the children brought their own chairs and joined with other residents and state and county officials to dedicate a beautiful new library. When it was time to move books from the old library building to the new branch, 170 students from Descanso Elementary School formed a book brigade. Officials closed the roads on April 18, 1997 so the students could participate. Each student collected a bag of books to carry about 700 books from the children's section. Accompanied by music from a tape recorder, and onlooker applause, the students carried their books for a half-mile - past Perkins store, along the road, across the bridge. Students had previously collected pennies to raise $2000 to buy furniture for the children's wing, and had written letters to state library officials requesting grants to help build the new building. On April 24, 1914, members of the Descanso Improvement Club applied to the Board of Supervisors of San Diego County for a library branch in Descanso. This tiny mountain community of about 300 at that time lacked a conventional facility, but set up the first library in the Oak Grove Store with Mrs. Inez Groton as librarian. In the ensuing years, the library moved from store to tavern to private home, surviving six different moves until 1961 when it came to rest in a small portable building located on Public Works property in the town center. This building served the community for 36 years. By 1984, Descanso was growing--now numbering about 3000--and its library needs were growing. A small group of residents met to form the Friends of the Descanso Library with Elsye Smith as president. The 12' by 16' building in use at that time had no room for study or browsing or even a restroom. The Friends launched what became a 12-year effort to secure a new library. Over the years, the group acquired a cost-free lease for a site on school property from the Mountain Empire Unified School Board. They held book sales, raffles, yard sales, and sponsored old-time western movies in a local barn. They researched and published two original histories of the Descanso area and used the proceeds from their sale to help fund the library. They acquired grants and local donations. The children of the Descanso Elementary school, in two separate drives, raised nearly $2000 to help furnish the library. 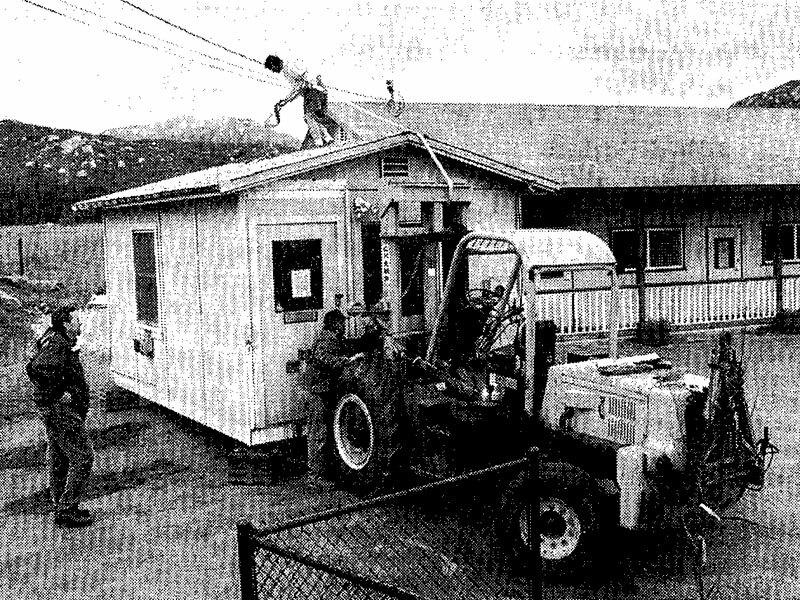 In 1995, a state grant of $74,500 from the CA Library Services and Construction Act Fund matched the equivalent funds contributed by the community and the County and facilitated the construction of a new 2000 sq. ft. library--ten times the size of its predecessor. In May of 1997, traffic was closed on Viejas Blvd. as the Descanso Elementary school children loaded up their book bags and helped carry the books from the old facility to the new one. The community still had a sentimental attachment to the old library, however. The following year, it was moved to the new library site where it nestles in beside the new building and serves as "The Book Room" from which the Friends now sell used books.